Continuing my series on British trees, I’m taking a closer look at the most festive of them all… the holly. In the coming weeks, many of us will probably have some form of holly in our house, whether it’s a real branch from a tree, a picture on a card, or a decoration on a cake. But we have been decking our halls with its boughs for many centuries before the advent of Christianity – and for some quite surprising reasons! 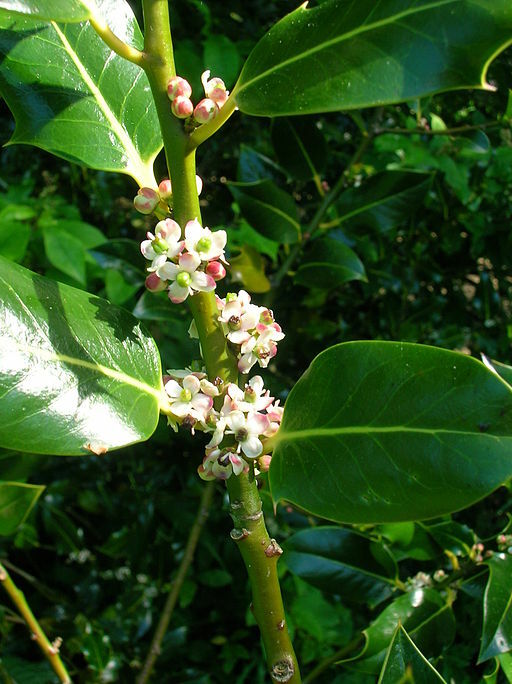 The holly (Ilex aquifolium) is a broadleaved evergreen tree that grows throughout western, central and southern Europe. In Britain it often forms an ‘understorey’ species in oak woodlands, and it is also found among the ancient pines of Scotland’s Caledonian forest. 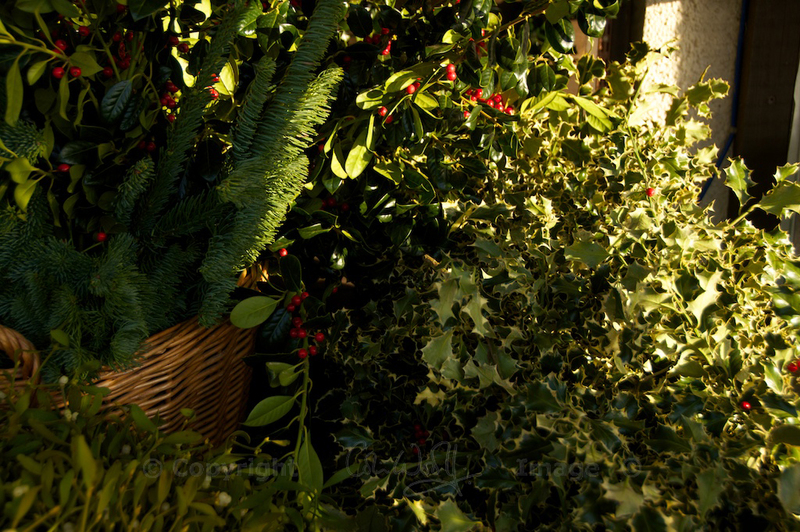 Holly is scarce in the windswept landscapes of Caithness, Orkney and Shetland, and in Lewis, Harris and Skye. One of the few remaining regions where stands of holly can be found is the New Forest in southern England. The old word ‘holm’ (holly thicket) is preserved in many place names around that region. Further north, the names ‘hulver’ and ‘hollins‘ have the same meaning. 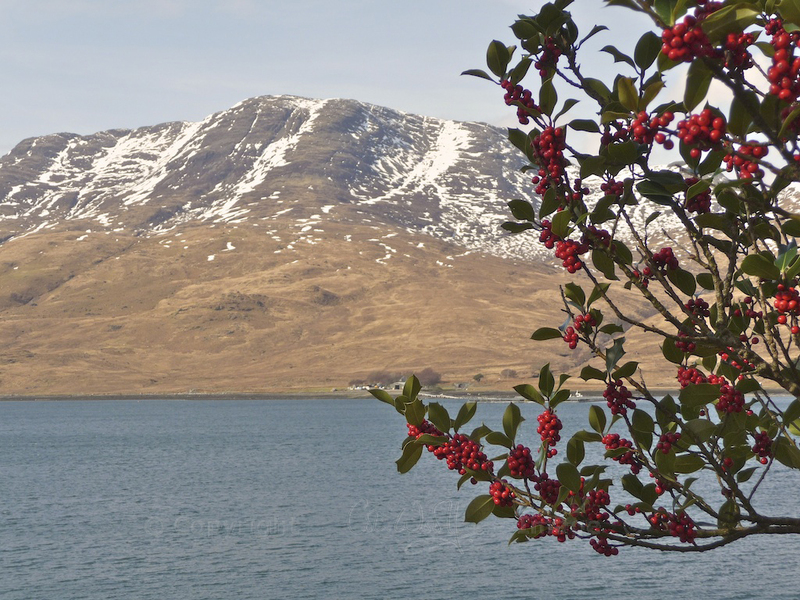 The Gaelic word for holly, ‘cuileann‘, gives rise to place names such as Cullen in Banffshire and Loch a’ Chuillin in Ross-shire; it is less clear whether the Cuillin mountains on Skye have a similar connection. 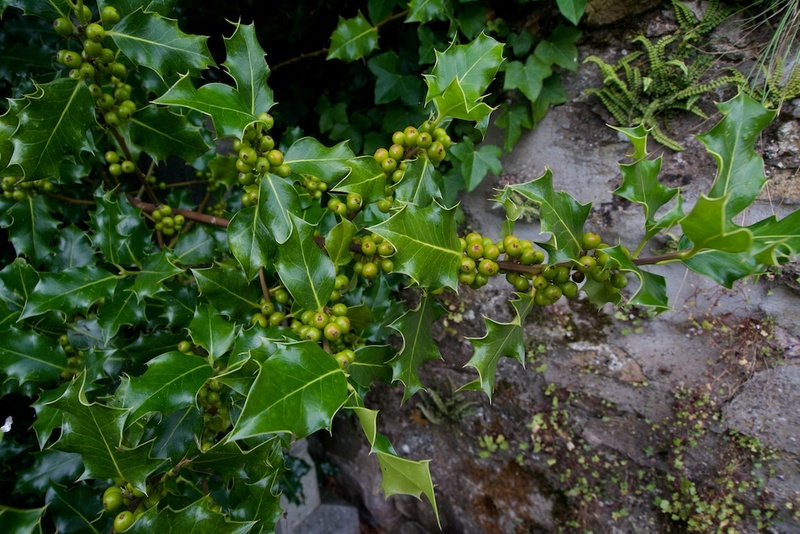 In Wales, holly is known as ‘celyn’, and is found in place names such as Bryn Celyn (hill of holly), Pentrecelyn (a village near holly trees) and Coed y Celyn (holly wood). Holly is slow growing, and is found at elevations up to 500 metres (1,640 feet) above sea level. 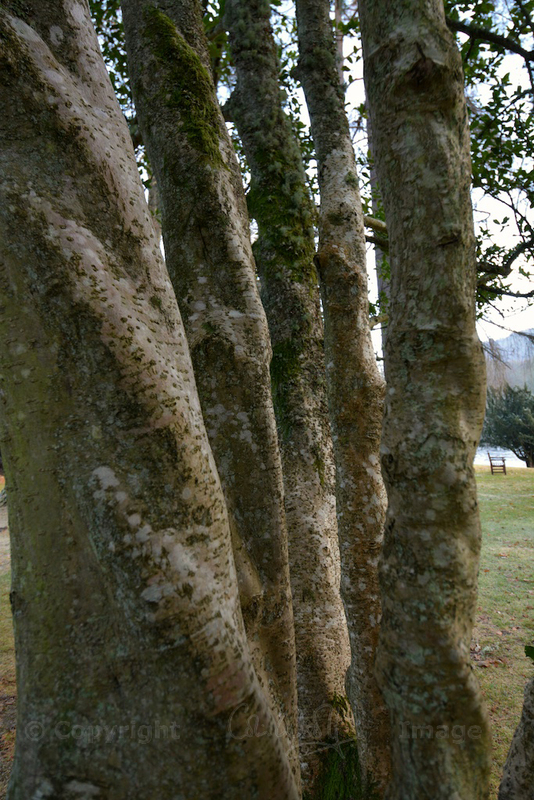 Covered in smooth, silvery-green bark, the trunk of an old tree can exceed 15 inches in diameter; if it is left uncut, a holly tree may grow to 30 feet in height. 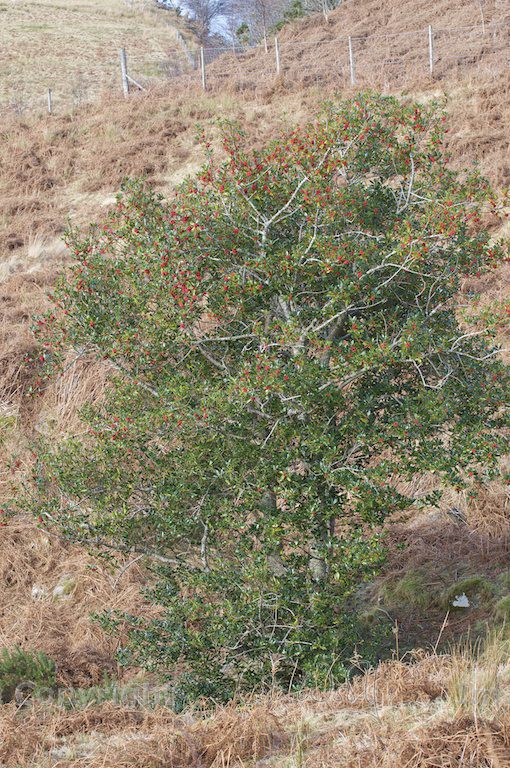 Hollies can live up to 250 or 300 years, although some of Britain’s oldest specimens, in the Shropshire hills, are thought to be up to 400 years old. 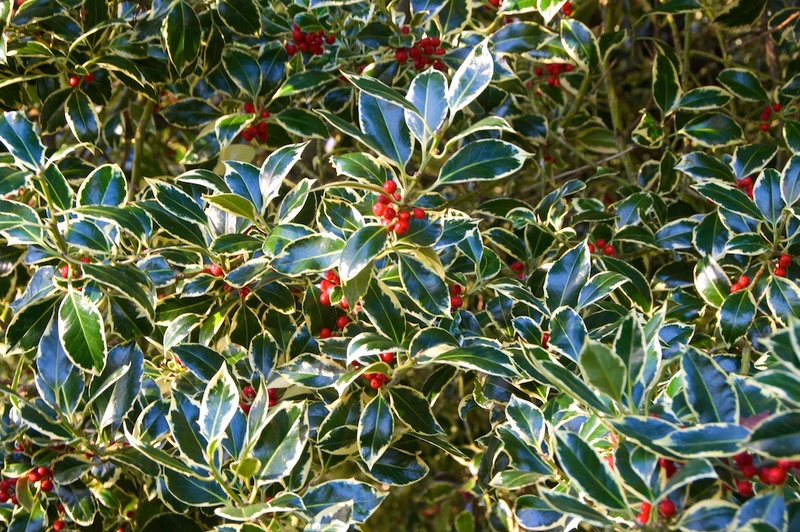 We’re all familiar with the holly’s glossy green leaves which have wavy margins and sharp spines. These are a natural defence against browsing animals, and it’s interesting to note that on larger trees, the leaves above about nine or 10 feet – out of the reach of hungry mouths – have only one spike, which is at the tip. Leaves may stay on the tree for two or three years. When they fall they take a long time to decay, so that skeleton leaves can often be seen on the ground. A bitter tasting alkaloid called ilicin is found in holly leaves, and this is believed to deter many insects. However, a couple of moth species, and caterpillars of the holly blue butterfly are still not put off, and holly leaves are also susceptible to attack by holly leaf miner, the larvae of a fly. Holly is dioecious, meaning that individual trees are either male or female. Flowering occurs on both male and female trees – but only when the tree is about 20 years old. Between May and August small four-petalled flowers appear, these being a delicate white flushed with pink. Only the female trees will bear berries, and to do so they must be pollinated by a male tree. This job is done mostly by bees, which are attracted by the fragrance of the flowers. Remaining on the tree throughout the winter, holly berries are a rich source of food for birds, including redwings, fieldfares and mistle thrushes; they are also eaten by wood mice and dormice. Red deer and sheep will browse on the leaves, undeterred by the prickles! 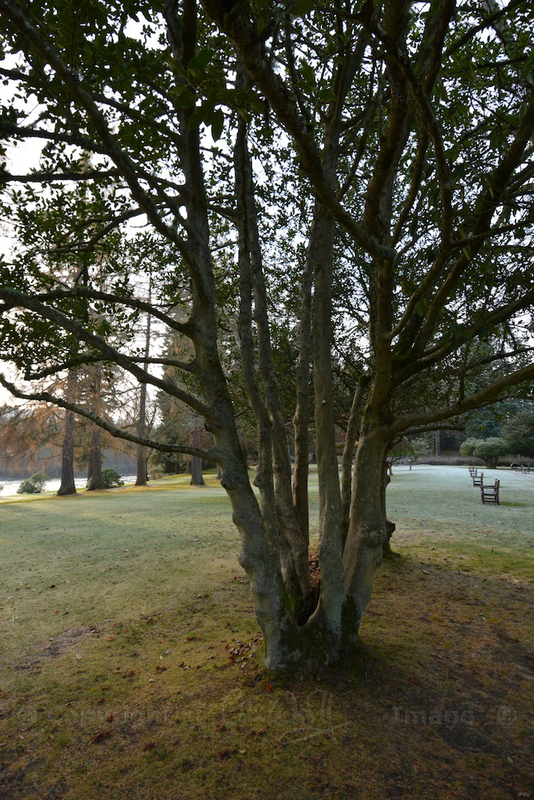 The impenetrable bush offers a welcome winter shelter for songbirds, and provides a safe nesting site in spring; on the woodland floor, the dense leaf litter makes a good refuge for hibernating hedgehogs and other wildlife including toads and slow worms. Each berry contains four seeds, and the birds that feed on them fulfil an important role by dispersing them in their droppings. In a ‘mast year’ a bumper crop is produced, and this is usually followed by a couple of lean years with fewer berries. In folklore, holly has long been said to protect against lightning strikes, and for this reason it was often planted close to a house. Ancient cultures associated it with the gods Thor and Taranis (‘taran’ means ‘thunder’ in Welsh). Modern science has since proved the truth of this ‘myth’ – the spines act as tiny electrical conductors! Long before the advent of Christianity, holly branches were brought into a home during the dark days of winter, to ward off evil spirits. In Celtic mythology, the holly was linked to the winter solstice: the Holly King was imagined to be a giant covered in holly branches, and he ruled during the six months from midsummer to midwinter, before yielding his power to the Oak King. For the Romans, the holly was one of the symbols of Saturnalia, their midwinter festival. To them, it represented immortality, and they gave it to each other as a gift for good fortune. As Christianity spread, the green leaves and scarlet berries came to be associated with Christmas; in fact, before the Victorians started the rather mad idea of bringing a conifer indoors, hollies were known to country folk simply as ‘Christmas trees’. The holly was always considered a ‘masculine’ plant, with a corresponding feminine presence in the ivy; this belief gives a deeper meaning to the old Yuletide carol, ‘The Holly and the Ivy’. 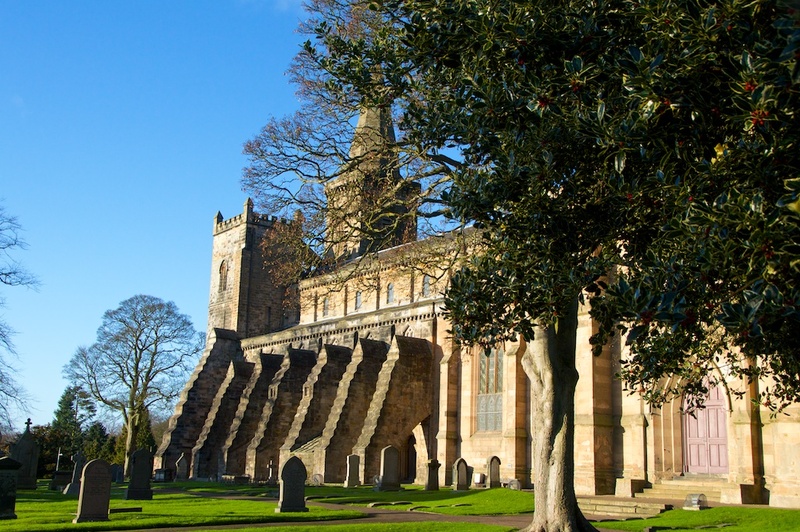 Some sources refer to an old English village custom of holding midwinter singing contests between men and women; the men sang carols praising the qualities of the holly, while the women sang to venerate the ivy. Interestingly, the dispute was resolved under a branch of mistletoe! The felling of holly trees has always been considered bad luck, although the cutting of boughs for decoration was allowed, and trees were pollarded (the top branches cut out) for use as a nutritious winter fodder for livestock. Hollies were often left untouched in hedgerows, and it is said that they were used as marker points for farmers when they were ploughing a field. The prickly bushes would also stop witches in their tracks, because witches – for a fascinating but unknown reason – were thought to run along the tops of hedges. The enduring nature of the holly features in this extract from a 16th century song, penned by Henry VIII to declare his everlasting love. It is a tricky question, but I am not entirely sure which of his everlasting loves he dedicated it to! An infusion of holly leaves has, in the past, been used as a cure for catarrh, pleurisy and smallpox, and to alleviate the pain of rheumatism. The berries can have violently emetic properties, however, being mildly poisonous, and they are dangerous to small children. Birds and mammals seem to be immune to these effects, but there is a recent recorded instance of redwings falling dead out of a holly tree, their crops full of fermenting berries. As a hardwood, holly is white, hard and heavy, with a fine grain. It stains and polishes well, and traditionally it has been used for marquetry, chess pieces, tool handles and walking sticks. Because of its reputation for controlling wayward spirits – including horses – it was chosen by ploughmen and coachmen for use in whip handles. At Tenbury Wells, on the border between Worcestershire and Shropshire, a special auction of holly and mistletoe is held every winter in a custom that stretches back over a hundred years. 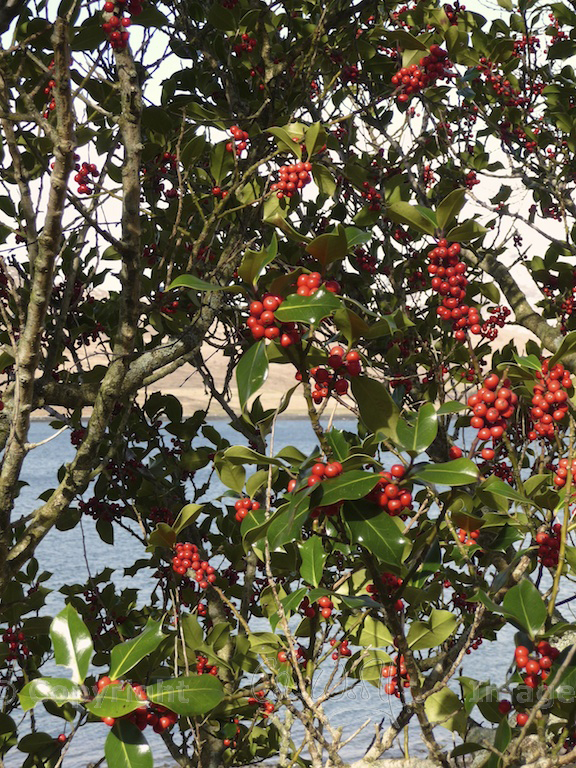 Branches of all kinds of holly – berried, unberried, green and variegated – are sent from the surrounding estates, and tied in bundles for purchase by florists and other suppliers. You can find the dates of this year’s auctions on the Tenbury Mistletoe Festival’s website. If you enjoyed this, you may also like to read ‘For the love of mistletoe‘, another feature on The Hazel Tree. I remember going to Tenbury Wells when I was young – it was jolly cold and we had soup from a flask in the car, but Mum needed an extra mug and bought one from a shop in the town. I still have that mug. Lovely post. That’s a nice memory! Tenbury is a lovely little place. I used to work for a land agent in Shrewsbury and the estates that we managed used to send holly there every year for the auction. Thank you – glad you enjoyed this! What an interesting post, Jo. It is great to read about plants in their historical context. That picture of the holly against the snowy mountains is beautiful. Thank you, Carmen! I enjoyed reading about the holly, and learned a lot myself. Yes, that’s a lovely place – Loch Spelve on Mull, taken in March, with lots of snow still lingering! Thank you very much! I’m sure you were very popular if your family had a holly tree! You don’t see so many of them nowadays in the UK, and I am sure that a lot of them were cut down in years gone by for their excellent wood – despite the superstition! Another wonderful post. I had to reduce the holly tree in my garden earlier & a couple of good straight branches are hanging in my garage waiting for me to turn them into walking sticks. Holly wood is hard & tough so I hope they will make good sticks. No horses here I’m afraid. If only………..
We’ve had a fairly mild autumn/winter so far – perhaps this is why the birds aren’t plundering all the berries, or maybe some haven’t arrived yet from further north. I have seen flocks of redwings and fieldfares about, but I don’t know if they are here in such numbers this year. Thanks for the comment – glad you liked it. Yes, Mull is really beautiful! I didn’t know that holly was rare in windswept areas, and I can’t remember ever seeing holly flowers but they’re beautiful in that delicate pink against the green. Interesting about Tenbury Wells, I’ve never heard of anything quite like that. I’m shocked by the redwings dropping out of the trees after gorging on berries, I knew birds enjoyed holly berries but perhaps there’s a lesson there about gluttony. Another most informative post! Thank you, Lorna! I’ve learned a lot myself by writing this. I was shocked to read about the redwings, too – I haven’t heard of that happening before. You’ve put together an excellent compendium of European holly lore. I’d heard of the holm oak, and now I understand the connection of the word holm to holly; in fact the scientific name of the holm oak is Quercus ilex. The two Ilex species native to central Texas have little red fruits, just as your holly does, but their leaves don’t have any spines. The species name of one of our two native hollies, Ilex vomitoria, signals the emetic property you mentioned. The leaves of that tree contain caffeine, and the American Indians used to make a tea from them. Thank you very much, Steve! That is very interesting about the hollies in the US, especially their Latin names. Quercus ilex – of course! The link between the holly and the oak is obviously something that goes back a very long way. This is actually my favorite Christmas song! I love British culture as well, so it fits perfectly. And I adore holly trees layered with snow! I’m excited for the upcoming winter! I’m delighted to hear that, Kate! I’m excited to see a bit of snow, too, because it makes the hills look wonderful. Thanks for your comment! What gorgeous pictures! I admit I’d love to play with the beautiful blue butterfly! Thank you so much for your wishes for Milou. We appreciate so much! Thank you, Texas! 🙂 Purdey would love the butterfly, too – there’s nothing she likes better, although flies are good sport, too. And you’re most welcome! What a wonderful post Jo- I especially liked the historical context! Thank you! I love finding out about the folklore and myths attached to trees – they tell us so much about how we were deeply connected to nature in centuries gone by.